The third mission of international experts assembled by the International Atomic Energy Agency (IAEA) has published its final report on decommissioning progress at the damaged Fukushima Daiichi plant in Japan. The 15-member team visited Japan between 9 and 17 February at the request of the country's government. The main purpose of the mission was to provide an independent review of the planning and implementation of decommissioning the Fukushima Daiichi plant. 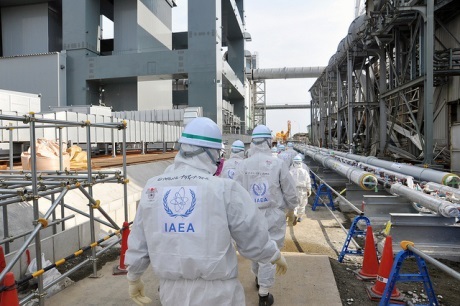 The mission was conducted based on IAEA Safety Standards and other relevant good practice, aimed at assisting Japan in the implementation of its mid- to long-term roadmap on cleaning up the site. The mission followed two similar missions in April 2013 and November-December 2013. The first of those was to carry out an initial review of Japan's roadmap. The second was to provide a more detailed review of the revised roadmap and mid-term challenges. "It is obvious that serious intention and commitment to improve execution of the planned on-site activities is in place, as is a common approach of all parties involved." The latest mission released a preliminary summary report at the end of their trip to Japan in February. It released its final report yesterday, having handed a copy to Japanese authorities on 13 May. The reports says, "Japan has achieved good progress in improving its strategy and the associated plans, as well as in allocating the necessary resources towards the safe decommissioning" of Fukushima Daiichi. The team said it was "impressed by the thoughtful, diligent and continued efforts of Japanese counterparts to carefully consider all advisory points [given by previous missions] and to work on their effective implementation." The report added, "It is obvious that serious intention and commitment to improve execution of the planned on-site activities is in place, as is a common approach of all parties involved." The team's report said: "The situation on-site has been improved since the last IAEA mission in 2013. Several important tasks were accomplished such as: completion of the removal of fuel from unit 4; the improvement and expansion of contaminated water treatment systems; the installation of new tanks and associated systems for contaminated water storage; the operation of underground water by-pass; and the clean-up of the site resulting in a reduction in radiological dose rate." However, the report says that, despite progress, the situation at the site "remains very complex". A number of "challenging issues" remain, it says, including the continued flow of underground water into the main buildings and the accumulation of contaminated water; the long-term management of radioactive waste; as well as the removal of fuel. The report contains advisory points on topics such as long-term radioactive waste management, measures against contaminated water and issues related to the removal of used fuel and fuel debris. An annex to the report contains the findings of IAEA experts who, at the request of the Japanese government, visited Japan from 17-21 April to receive additional information about the management of contaminated water and Tokyo Electric Power Company's (Tepco's) efforts to improve public communication and outreach. In a statement, Tepco president Naomi Hirose said: "We appreciate the comprehensiveness of the report and its recognition of the considerable progress our workers and those of our contractors have made at Fukushima Daiichi." He added, "At the same time, we appreciate the many suggestions the report makes for further efforts and, in some places potentially different ways of approaching a problem. We will diligently pursue these recommendations and will continuously improve our efforts by utilizing the IAEA's knowledge."